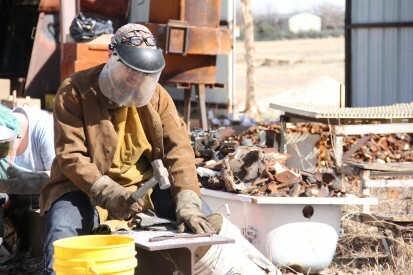 A Fine Arts student at Mesalands Community College, uses a hammer to break up the pieces of iron, in preparation of the pour. Mesalands Community College is requesting donations of cast iron, such as radiators, bath tubs, and sinks, for the 19th Annual Iron Pour on March 6-11, 2017. These items must be able to be broken with a sledge hammer. Engine blocks cannot be used for this purpose. To supply donations, please contact the Fine Arts Department at (575) 461-4413, ext. 160.